Duration: 6-7 hours. Visit starts at 5am. Two families. Only 8 people can visit at a time. An equally exciting opportunity while in Rwanda is chimpanzee tracking. Though they’re not the Silverback Gorilla, comparing the two tracks would be like comparing apples to oranges. 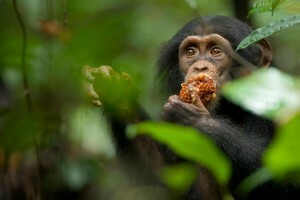 Chimps are highly social and active in comparison to the docile mountain gorilla. They form in communities of more than 100 members and break off during the day into smaller groups to forage for food in different directions. Consequently, chimpanzee tracking is much more unpredictable in terms of successful sightings because they’re either swiftly swinging in the canopy feeding high in the trees, or running along the dense forest floor. Regardless, chimp tracking is never a futile experience. The surrounding booming sounds of the smaller groups communicating to one another in what is called a “pant hoot” is one of the most hair-raising, distinct sounds of the Central African forests only possible to experience when following these amazing creatures that share 94% of our genetic material.